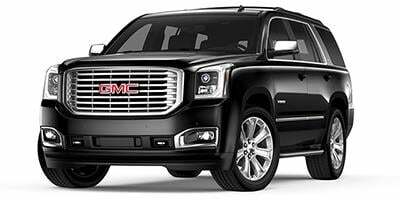 Be the first to review this 2019 GMC Yukon. Closely related to Chevrolet’s Tahoe and Suburban, the GMC Yukon and its extended-length Yukon XL companion continue to provide a traditional, truck-based SUV experience. Fitted with three rows of seats, the full-size SUVs may be old-school in theme, but they include abundant technology and capabilities for modern-day families. Despite their heft, GM’s biggest SUVs manage to avoid feeling like relics from another era. For the 2019 model year, GMC has added two option packages: the Graphite Edition and Graphite Performance Edition. Each is available for the SLT trim level. Both versions feature a darkened appearance, but the Performance version gets a bigger V8. GMC’s Yukon lineup includes the standard Yukon and lengthier Yukon XL. The extended version is 14 inches longer in wheelbase and 20.5 inches longer overall. Cargo capacity behind the XL’s third-row seat is more than double that of the standard model. Trim levels include base SLE, SLT, and near-luxury Denali, in addition to a value-priced Standard Edition. Denali trim pushes the Yukon into the realm of Cadillac’s Escalade, which uses the same platform. GMC offers a choice of two big V8 engines: a 5.3-liter that makes 355 horsepower and 383 pound-feet of torque, or a mighty 6.2-liter that packs a 420 horsepower, 460 pound-feet wallop. The smaller V8 mates with a 6-speed automatic transmission, but the 6.2-liter drives a 10-speed automatic. Both come with either rear-drive or four-wheel drive. Fuel economy is reasonably good, helped by cylinder-deactivation technology at higher cruising speeds. With its husky ladder frame, a Yukon can tow as much as 8,500 pounds. Few safety features are standard in the base model. Bucket seats include a front-center airbag. Upper trim levels, including the Standard Edition, get an Enhanced Driver Alert package that includes forward collision alert, lane-keeping assist, lane-departure warning, and low-speed forward automatic braking. SLT and Denali trim levels can have adaptive cruise control, as an option. Full crash-test ratings for the 2019 Yukon are unavailable. The National Highway Traffic Safety Administration gave the Yukon four stars overall, with five stars for frontal and side-impact tests. The Yukon XL fared worse, earning only a four-star score for frontal impact. Rollover prevention - a calculated figure - scored only three stars. Yukon SLE ($49,500 with 2WD, $52,500 with 4WD) comes with the 5.3-liter V8, cloth seat upholstery, three-row seating, 18-inch wheels, 8.0-inch touchscreen, Apple CarPlay and Android Auto, Bose audio, front/rear parking sensors, rearview camera, and three-zone automatic climate control. Replacing the standard front bucket seats with a bench costs $250 extra. Yukon SLT Standard Edition ($54,700 with 2WD, $57,700 with 4WD) adds leather-appointed front seats and a power liftgate. An impressive suite of active-safety features is standard, including GM’s safety-alert seat. Yukon SLT ($57,500 with 2WD, $60,500 with 4WD) comes with leather front-seat upholstery, heated front and second-row seats, ventilated front seats, a heated steering wheel, keyless start, and power-folding second and third rows. Lane-change assist and blind-spot alert are standard. Yukon Denali ($66,600 with 2WD, $69,600 with 4WD) substitutes the 6.2-liter V8 and adds upgraded Bose audio, active noise canceling, 20-inch wheels, and a magnetic suspension. Also standard are perforated leather-appointed seats, heated/ventilated front seats, and navigation. Options include power side steps and 22-inch wheels. Yukon XL SLE ($52,400 with 2WD, $55,400 with 4WD) is similar to Yukon SLE, but on longer wheelbase. Yukon XL SLT Standard Edition ($57,600 with 2WD, $60,600 with 4WD) is similar to Yukon SLT Standard Edition, but on longer wheelbase. Yukon XL SLT ($60,400 with 2WD, $63,400 with 4WD) is similar to Yukon SLT, but on longer wheelbase. Yukon XL Denali ($69,500 with 2WD, $72,500 with 4WD) is similar to Yukon Denali, on longer wheelbase. Chiseled design work conveys a sense of elegance that corresponds to the Yukon’s hefty sticker price. GMC’s version boasts curvier lines than Chevrolet’s Tahoe. Yet, little is done to conceal the Yukon’s overall boxy profile. Swept-back headlights work with a large, prominent grille to intensify front-end appearance. At the rear, little difference can be seen between the Tahoe and Yukon. Rectangular taillights flank a big, boxy tailgate. Denalis, in keeping with their reputation, wear more chrome. Nearly three-fourths of Yukons sold have been Denalis. Though massive on the outside, GMC’s Yukon isn’t quite as spacious as some crossover models. The curvy, symmetrical dashboard would seem appropriate for a high-end sedan. With either a bench or captain’s chairs in the second row, most adults should feel comfortable. Rear-seat occupants can expect a snug experience, unless they’re inside the considerably longer XL version. Cloth upholstery is standard in the base model. Other Yukons get leather. Denalis feature simulated wood accents. Even lesser models use soft-touch materials and stitched surfaces. GMC’s excellent infotainment system, with a high and prominent 8.0-inch touchscreen, includes Apple CarPlay and Android Auto connectivity. With third-row seatbacks upright, cargo space in the standard-length Yukon is more limited than expected. Fold the second and third rows flat, and volume grows to 95 cubic feet ΓÇô but 121 cubic feet in a Yukon XL. Accommodations are more comfortable in an XL, but it’s a massive vehicle to maneuver. Ride comfort is a definite virtue, especially on SLE and SLT models with smaller wheels. Magnetic shock absorbers on Denali versions help filter out surface imperfections, while improving handling. Steering is actually rather deft, without incurring much body roll. Considering its weight, a Yukon is surprisingly swift, though its heft becomes more evident when rolling along curvy roads. The 5.3-liter V8 boasts a refined, muffled demeanor. Naturally, the 420-hp, 6.2-liter V8 delivers stronger-yet performance. It’s standard in Denalis and with the new Graphite Performance Edition package. Because of its dimensions, the Yukon cannot excel off-road. Still, it suffices after the pavement ends, helped by low-range gearing. Yukons are thriftier than expected, if far from frugal. Rear-wheel-drive Yukons with 5.3-liter V8, in either size, are EPA-rated at 15/22 mpg City/Highway, or 19 mpg Combined. Four-wheel drive drops the Yukon estimate to 15/21/17 mpg, versus 14/21/16 mpg for the XL. With the 6.2-liter V8, the rear-drive Yukon or Yukon XL is EPA-rated at 14/23 mpg City/Highway, or 17 mpg Combined. Four-wheel drive lowers the Yukon estimate to 14/22/17 mpg, or 14/20/16 mpg for the Yukon XL. Powerful V8 engines, admirable build quality, and classy interior details mix with outsized dimensions and weight in GM’s traditional, full-size SUVs. Towing is a breeze, with acceleration brisker than anticipated. Especially in XL form, Yukon promises great passenger- and cargo-hauling capabilities, though prices can stagger one’s senses. Chevrolet equivalents tend to be a bit cheaper. 2019 GMC listings within 25 miles of your ZIP code. Find 2019 GMC listings for sale near you.